The JFACC is responsible for planning joint air operations and uses the joint operation planning process for air (JOPPA) to develop a JAOP that guides employment of the air capabilities and forces made available to accomplish missions assigned by the JFC. Planning for joint air operations begins with understanding the JFC’s mission and intent. The JFC’s estimate of the operational environment and articulation of the objectives needed to accomplish the mission form the basis for determining components’ objectives. The JFACC uses the JFC’s mission, commander’s estimate and objectives, commander’s intent, CONOPS, and the components’ objectives to develop a course of action (COA). When the JFC approves the JFACC’s COA, it becomes the basis for more detailed joint air operations planning—expressing what, where, and how joint air operations will affect the adversary or current situation. 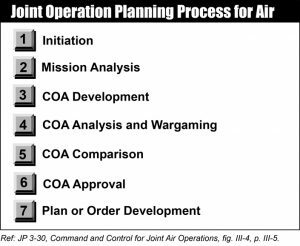 JOPPA follows the joint operation planning process found in JP 5-0, Joint Operation Planning, with specific details for joint air operations. JOPPA drives the production of the JAOP and supporting plans and orders. JOPPA may be utilized during deliberate planning, producing JAOPs that support OPLANs or concept plans. JOPPA may also be utilized as part of crisis action planning. It must always be tied closely to the overall joint planning being done by the JFC’s staff and other Service or functional component staffs. While the steps are presented in sequential order, work on them can be concurrent or sequential. Nevertheless, the steps are integrated and the products of each step should be checked and verified for coherence and consistency. 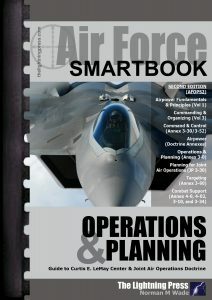 Joint air operations planning is covered extensively in Chapter 6 of AFOPS2: The Air Force Operations & Planning SMARTbook, 2nd Ed. (Guide to Curtis E. LeMay Center & Joint Air Operations Doctrine), to include two pages on planning for joint air operations, two pages on the joint air estimate, 18 pages covering the steps of the joint operation planning process for air (JOPPA), four pages on joint targeting, and six pages covering the joint air tasking cycle.